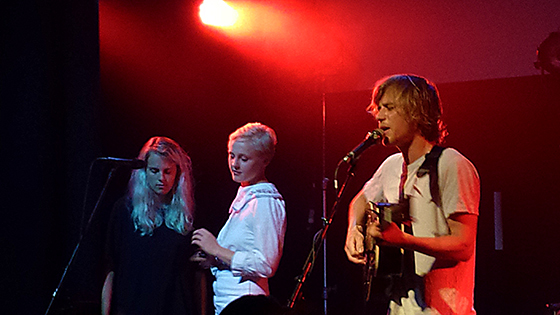 This past Wednesday, Laura Marling, Johnny Flynn, and Marika Hackman came to Lincoln Hall and did something special. Most shows are very typical affairs with the opener, middle, and headliner never actually connecting with one another. Just different bands playing and different times and that's that. Sometimes you'll see one member play with another, but it's rarely made into a big deal. That was not the case with this trio of musicians. 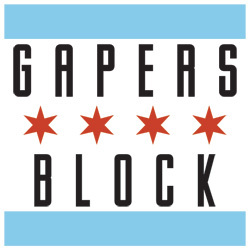 They created a communal event where stories and jokes were peppered between collaborations, making for the truest and most entertaining folk show I've seen and heard. I wasn't entirely familiar with Marika Hackman before the show, but after her opening set I can safely say I am enthralled with her music. Hackman came to the stage quickly and unassumingly, going straight into "Retina Television" and "Drown". Her guitar was gentle; exactly what you would expect from a folk singer songwriter, but her lyrics hit the crowd with almost no warning. were a sad and melancholy veil over a sinister face. On "Drown" she serenades the audience with "I'd choke on you if I could/Maybe I will." Death and pain were all across her songs without ever really holding back, instead taking the listener headlong into the intensity of her lyrics. Hackman remarked that people back in the UK had often to her to smile more on stage, something she felt would be odd considering the themes of her songs. The crowd giggled then surged with laughter as she introduced her next song with only its title, "Cannibal". The song takes the title's metaphor to an unsettling but utterly satisfying maximum, letting the hideousness of carving and stabbing relay a need for love. It was a perfect example of her wry humor that continued throughout her set. She talked wistfully of hoping to start a trend of girls wearing boxers as shorts and called "Monday Afternoon", a song full of wanton desire and mortality, a real clap along banger. After a cover of Joanna Newsom's "'81" and her own "Next Year", she thanked her first and incredibly lively Chicago crowd with a little taste of "Cinnamon". 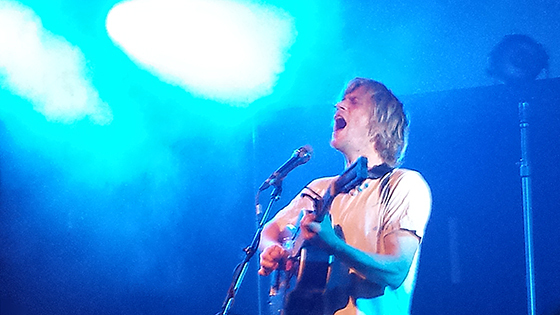 Johnny Flynn is an extremely talented fellow. On top of being a multi-instrumental musician, he's also a very good actor, having starred on stage, film and television. However memories of his roles washed away the second he started playing. His voice came out in a booming fashion, quieting every sound around him with "Lost and Found". Between songs his personality entertained the attentive audience. He told a completely inoffensive cheese joke and stories of being on tour, such as tricking his friend into eating hot salsa for a free meal only to realize Lincoln Hal would be giving them food later on. "What's worse having to pay for dinner or a dinner you can't taste?" he asked. While these moments were fun, it was his performances like "Murmuration" that pulled people in. Flynn's set was particularly special as it came to a close. His solo set transformed as he brought out Laura Marling and her band to perform their duet "The Water". The crowd obviously lit up and began cheering for the Marling's early appearance. Just when I though he had out done himself, Flynn reintroduced Hackman to the stage. All of the evening's musicians joined together for "Tickle Me Pink", another amazing highlight for the show. There was very little time wasted for this show. 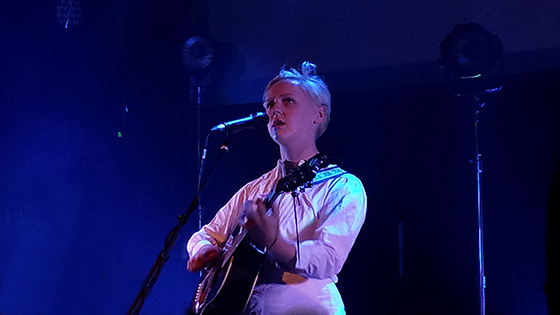 It wasn't a feeling of urgency that filled Laura Marling's set, but rather a calming basking in the moment. Marling began her show with two long and gorgeous medleys, encompassing "Take The Night Off", "I Was An Eagle", "Howl", "David", and I'm sure a few that I missed. The crowd whispered along with her words, occasionally finding themselves at familiar songs that brought it out of them. She played this start by herself with a slowly ruminating desert scene playing behind her before being joined by bassist Nick Pini and drummer Matt Ingram for the majority of the night. Marling continued on with a lovely style, filling her set with breath taking performances. After assuring the crowd that those would be the only two medleys of the show, she continued with "Master Hunter" and "Love Be Brave". This early on she was already stretching the emotions of the crowd, their hushed singing falling in line with Marling. Even when she covered Foo Fighter's "Tired of You" with Hackman, the crowd couldn't help but stay in tune with them. But it was songs like "Sophie" and "Rambing Man", which came later in the set, that really captivated the crowd. Marling's time with was filled with beautiful quirks that endeared her to the receptive audience. She noted she was trying to get better with stage banter as stumbled through the intro to her cover of Dolly Parton's "Do I Ever Cross Your Mind", explaining how it's a good song to practice fingerpicking her guitar. She rolled with every misstep and occurrence, such when someone sneezed during "Alas I Cannot Swim" she snuck in a "bless you" as to not leave them hanging. 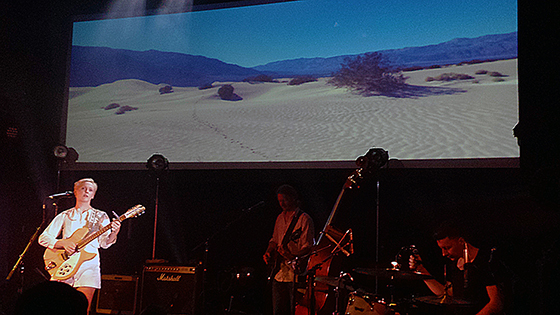 Marling reached her idiosyncratic height when someone requested "Failure". 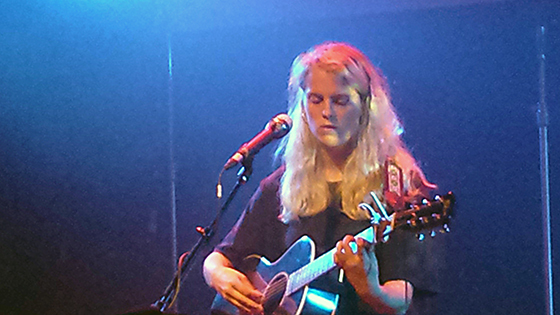 Marling obliged, even though she had actually forgotten her own lyrics. 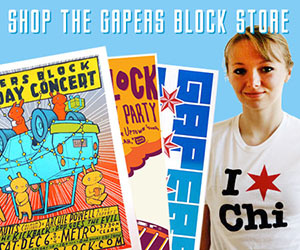 Luckily fans lead her in, reminding her of the openings of verses and she quickly caught on. Marling ended her set sans encore, instead opting to reignite the communal nature that had been floating around the air that night. She invited Flynn to play violin for "Worship Me", the closing track of Short Movie. It was a beautiful moment that was then surpassed with the following final song. Hackman returned and once again every musician who performed was on stage. Marling lamented not having her guitarist around due to visa issues for this next song, a cover of Steely Dan' "Dirty Work". Hackman and Marling traded verses as Flynn switched to a trumpet, enriching the audience with every passing note. It was a wonderful way to cap the show, bringing everyone together for a rousing experience.